Simply put, your brand is your promise to your audience. It tells them what they can expect from you and your work, and it differentiates what you have to offer from that of your competitors. Your brand stems from who you are, how you want to be known and who people perceive you to be. Branding is how we market ourselves to others, and the best way to do so is by discovering and revealing who we are on the inside. Branding has become more about serving others, and by doing so, your sphere of influence and visibility increases. Authenticity and transparency too, are key to building trust and community with your audience. And although the web can amplify an author’s visibility, building your brand takes a lot of time, energy and determination. The reward for all this effort? Empowerment, confidence and a network of loyal fans. The first step in building your author brand is to take the time to develop and define your central philosophy. Discover who you are and what you want to do; articulate your unique areas of advantage or value and why you are different. Unfortunately there is no simple step or quick fix for this. It requires some intensive self-analysis and introspection. Sit down at your computer or grab a pen and notebook and start brainstorming. Focus on your strengths, passions and goals. How do you want to be known? What words, ideas, concepts and feelings do you want people to associate with you? What mood or immediate impression do you want to evoke? Do some research. Check out the sites of authors, bloggers, photographers, musicians, designers and other creatives. What attracts you? After you’ve created this cacophony of ideas, start looking for themes, common threads, or repetition. Refine, tighten and simplify what truly represents you and your writing best. Focus; you can’t be all things to all people or open to every opportunity. Sometimes limiting your options can help you hone and sharpen your content and lift you to new levels. You also need to look to the future and be careful to brand in a way that allows you to expand into new writing areas or extend over multiple books or freelance work. Consider an “umbrella” brand. Or if your work is very diversified, consider creating different brands for each area; just consider the work involved in maintaining several brands. What you discover should be woven throughout your brand with words and images that reflect your refined ideology. Now that you have refined your brand personality and taken the time toward solidifying and polishing your concept, it’s time to live your message and incorporate it into all of your plans for the future. Being a creative doesn’t give you permission to be unprofessional, so map out your plans and expectations, and what you will need to do to accomplish them. Begin gathering or developing content, including pictures, text and video. Ensure that all elements are consistent with the brand or image that you’ve developed above. Organize how you will communicate your brand. Some ideas for getting your message out there might include guest posting, writing articles for magazines, social media, attending networking events, speaking engagements or pitching the media. Set up an editorial calendar. This not only aids in organization, but can increase your productivity and decrease overwhelm. As ideas come up, you can add them to the calendar, move things around and notice “holes” in your content. Design your author website, business cards, bio, author photo, cover design and print materials with your brand or message in mind. Be concise and consistent. Remember that colors, fonts and other imagery should all add to the story, not detract from it. Make sure your logo graphically represents and unifies your message and develop a tagline that quickly conveys what you do and differentiates you from the competition. Stay on topic. Without clear planning, it is easy to slide off course and lose the interest of your target readership. That said, sometimes doing the unexpected can result in excitement for your regular readers and draw in new readers from other sources. Taking some risks with your content and mixing things up a bit can be great, but knowing your audience is key. Use what you’ve got to get what you want in the future. You don’t have to aggressively push your past accomplishments, but there is no need to be shy either. Ensure what you’ve already achieved gets the recognition it deserves. Learn from others. Notice what others are doing effectively and try adapting some of those concepts to your own promotional efforts. Tackle one thing at a time, and schedule with room for hold ups. If things start to pile up because of missed deadlines and unforseen delays, reevaluate, prioritize and get back on track. A solid launch of your new writer’s brand is very important; don’t hurry and don’t be sloppy. This is a good reason why you don’t want to wait to have your book deal in hand before you begin building your author platform. Having to hurriedly piece something together will only end in disappointment – for you and your potential readers. Take the time you need to best represent your brand. However, also keep in mind that perfection isn’t possible. Put your best work forward, but understand that it is a work in progress. Over time it will be your audience’s feedback and comments that help “perfect” your brand. The launch of your website and brand is a big–and usually one time–event. So take advantage. The Field of Dreams, “build it and they will come” approach is not ideal. Outline a plan for the weeks prior to your launch, the day of launch, and beyond. Decide upon and outline your launch goals. What do you want to achieve? Start building buzz early. If you already have another blog or website, mention the launch of the new site there. Social media (Twitter, Facebook), guest posting on other sites, friends and their networks. Develop exceptional pre-launch content. Craft posts that are core to your message and are indicative of the kinds of things you’ll be writing about in the future. Launch week promotion. Leverage social media by letting your followers know of your launch date and providing progress updates. Try and schedule a guest post for launch week to drive more people to your new site. Launch day and beyond. Make sure your launch day content is unmistakably great. Consider a press release, a special sale, promo or offering your prospective audience something for free. Connect and respond to your new visitors and try and form a bond to keep them coming back for more. Like it or not, social media is playing a greater and greater role in establishing an author’s notoriety. And it is yet another avenue to help you gain exposure for your message and connect with your “disconnected, but yearning” tribe. It is not, however, a platform where you should continuously self-promote. By using the same photo, style and other brand elements across different social media platforms, you can reinforce the image you want to represent. You can also stay connected and address any questions or concerns by monitoring your social accounts. If you are new to social media, you may find it difficult to embrace the possibilities. If you are over the age of 12, it won’t necessarily come easy… But stick with it and try to stay current; you’ll be glad you did! Technology also gives us the benefit of extending our reach – globally in many cases. Investigate opportunities that allow you to connect with other markets. Who you associate with matters, so be mindful of the clients and organizations you choose to do business with– your partnerships will represent your brand as much as your writing does. Managing your brand is simplified by ensuring you’ve done all the work noted above beforehand. But it is important to revise your goals and plans to accommodate new growth or changes. Just ensure that changes are made with your overall strategy in mind. Stay true to your brand; end projects or partnerships that are unsatisfying or do not support your direction or goals. Search out opportunities that can strengthen what you have to offer. Show some love to your readers or clients; encourage feedback, address concerns and be appreciative. Listen to what your audience and the writing community have to teach you. Be grateful for the knowledge and apply what you learn. Get noticed by showcasing your best work, remaining professional and being innovative. Push yourself to learn new things, stay current and expand your personal boundaries. If you outsource, do it carefully. Ensure that the quality and purpose of your brand are understood and maintained by others that are representing you. 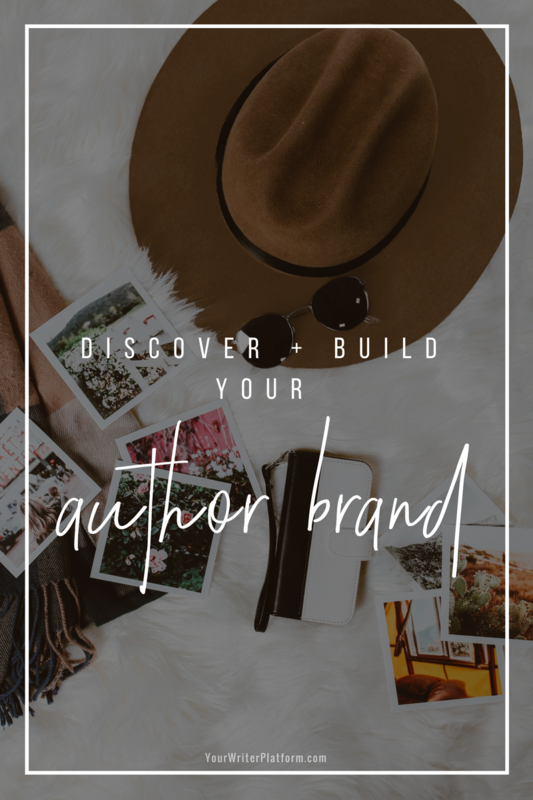 The key takeaway is that building a solid and successful author brand takes time and perseverance. The rest of your platform will grow from the careful work you do now. What are some of your thoughts on branding? 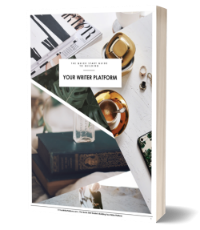 Do you believe it is an important component in building a writer platform that resonates with an audience? Please share your thoughts in the comments below. Perfect, Stephanie! I’m happy to hear that you found the article useful. Good luck on your brand building, and let me know how it goes; I’d love to see the before and after! Hi, I’m really enjoying your articles. One thing that doesn’t work (for me) is that I’m on Blogger. You mention quite a few handy tools, which grab my attention, only to find they won’t work for me. Otherwise, great points and I’ll utilize what I can. Sorry, Aura! I know that’s frustrating! But it’s also why I recommend WordPress; there is so much opportunity to do cool stuff! If you haven’t already, you may want to read Set Up Your WordPress Blog in Under 15 Minutes, for some reasons as to why I believe WordPress is a great option for writers. Thanks for such an informative article, Kimberley – it’s given me a lot of food for thought! I particularly loved the first point on brand personality. I found it to be quite a liberating idea that we can control how our ‘brand’ is portrayed. Good luck, Chrissa and thanks for stopping by! It is interesting that you say this, Kimberly, about why authors fight the business side. I am just finishing up my BFA studies at Goddard College and have thought about this very thing. Though I feel I have learned so much about the craft that I didn’t before, they could not help me in this area, an area I have instinctively known is important. I have come to this conclusion: There are a many authors who feel passionately that what they do is art–I have nothing against this belief–therefore, business and money becomes the nasty and dirty. it is an old-world way of thinking. I think it is art to create a deeper connection with your work. It challenges another side of you and as a firm believer in always stretching myself, which in turn will make me stronger and better writer, creating this part of my work is paramount. You mentioned that oh, so famous Field of Dreams quote, “Build it and they will come.” Any writer who writes out of a passion to share their perceptions of the world, to encourage others to look at the world just a little bit differently than they usually do, has the responsibility to go out and make themselves known. Thank you for your work in trying to get us to see that it doesn’t have to be dirty and nasty in order to do so. Exactly, Penna! I love it when a writer “gets” that their job is two-fold: create something brilliant AND get it into the hands of the people who will most appreciate it. I think it’s our duty as creatives to ensure that our art is not left languishing in obscurity. Money is a side issue. Connection and engagement with the people who need/want/love what you have to offer is the key. Once you have that, you can decide if you want to earn an income or spread your ideas further by offering them freely. There is nothing dirty about mixing passion and initiative, or building a career out of your creativity and art. What I found useful in this article…so much, but it comes down to this: the style is neat and clean (nothing flashing in the sidelines pulling away my attention), clear concise writing, step-by-step directions, and not several links every line. This is the best info about branding that I have come across. You are so welcome, Patti! I’m glad you enjoyed the article! Thanks for taking the time and effort to post this! It’s very helpful. I am trying to become a published author and I am looking for ways to make a lasting impression–not just a splash. Your insight and recommendations are most welcome!! Great article! I’m a “newbie” and am just starting to put together my author platform, scheduling my blog’s first post for mid-August. Your comments on launghing your platform are very timely. Great article, it answered many questions that I had and a few more I hadn’t thought of asking. I’ve just published my first book on Amazon called “Me & Gus on the Roof of the World”, while it flew off the eShelves in the first week, it has slowed somewhat since. Hopefully, by employing some of your ideas listed above, I’ll be able to give it a kick in the backside. This has been very useful! Thank you. What brilliant content Kim! I’m in the process of self-publishing my first book & have been steadily working on the website/twitter/linkedin/facebook-all ‘brand’ related, but have had an outline for my first blog post filed away thinking it might seem premature to blog before the book is published. You have inspired me to take my very overdue leap of faith as a blogger, haha! Keep inspiring with great, no nonsense content!!! Fantastic, Kay! I’m glad I’ve inspired you! Best of luck! Yes, I’ll get right to it.. I need an about me page and I shouldn’t hide, I have to let them in into my story and better still they should play the part. Another one to bookmark. Thank you. Kimberly, I’m new to your site, came here via a link in Joel Friedlander’s post about Why Building an Email List is Essential for Authors about 3 hours ago and haven’t left! I signed up for your newsletter and bookmarked all the links you shared in your ebook and I just have to say HOLY MOLY! It’s a ton of work, I knew that already, but what I really want to say is THANK YOU! You have an incredible, I mean INCREDIBLE amount of super useful and important information here in your blog and I know you’ve heard it before, but Ima say it again – THANK YOU for YOUR time and effort, blood, sweat, and tears. These posts are amazingly helpful and informative and I can only imagine how long they took you to put together. Well, I’m judging by my pace in putting posts together (akin to a snail), and perhaps I shouldn’t, but still – so helpful. I’m on my way to How To Target An Audience now, but I just wanted to drop you a comment with my eternal gratitude for offering so much wonderful information. I’m a fan. You rock! Thanks so much for your profuse praise, and I’m pleased to hear that you’re getting so much out of the site. It is absolutely my pleasure to share the info I’ve gained, and it’s fantastic that you’re ploughing through so many articles! What a trooper! It is a lot of work, especially at the beginning, but remember: you’re at the start of your brand new career as a writer. It will take time (and as you mention, blood, sweat and tears), but it will be sooo worth it! Thanks again for such lovely feedback, enjoy the posts (remember to rehydrate! 😉 ) and if you have any questions, feel free to shoot me an email anytime. I’m here to help!